..."If only I could find the right person for me, that someone who'd love me unconditionally, share a life together and make me feel like it will last?" If you see yourself in the previous statement, then you're in the right place at the right time. Read on and find out how I can help you find your love at last! Schedule Your No Obligation, FREE, 20 Minute Singles Coaching "Luvaluation"
I'm Dr. Renee Michelle Gordon. Your love & relationship coach. I'm committed to helping you find your love at last. I will share with you the secrets that I used to find my soulmate, my Mr. Right, my love at last! This is not another, "we'll show you how to fill out a dating web site profile" type coaching. I'll help you re-discover who you are first, your values and your beliefs, the core of who you are so you are prepared to match the right person to you. Next we introduce to you our process of "Love by Design™". This is where you design exactly who you want in your life. Next, we'll show you some alternate places that might be more effective in your love search.These are both traditional and non-traditional places that put you into the right place at the right time to find your soulmate. Okay, now we are ready to use the internet as a powerful tool to find your soulmate. After all, that's how I found my sweetheart, on-line! I'll help you through the steps from looking like your authentic and beautiful self in your profile pictures to writing a magnetic message in your profile description. Finally, I teach you how to be discerning in your decision and not make the same past mistakes that you've made before. Now you've found Mr. or Mrs. Right! Now I'm here to guide you to relationship bliss. Once you've found your life partner, my job has just begun. I'm your trusted advisor and confidant, to help you keep your new and exciting life in context and help you stay focused on the life that you designed. After all, aren't you worth getting a loving and mutually respectful relationship right, once and for all? How long do I date? How do I get my "mojo" back? How to dress for success & romance? How do I use the RAS to find my love? What's the proper etiquette in dating? How do I know he or she is the "one"? Once you found the "one", how to keep that spark burning! Have the resources & means to make things happen when you want it! If this describes you. You may be the right fit for my Exclusive Protege Package. Let's set up a private call and outline how we can help you quickly, efficiently and most importantly, successfully. Have your assistant schedule a time that best suits our respective schedules by emailing to Connect@LuvAtLast.com to start the process. See package comparisons below! Tired of wasting your time looking for your Mr. or Mrs. Right? Willing to do what it takes in order to have the life of your dreams? Realize the value of your own time and want a qualified guide to help you navigate the murky waters of dating. Made the mistakes before with that Mr. or Mrs. "Wrong" and definitely don't want to attract that person again! 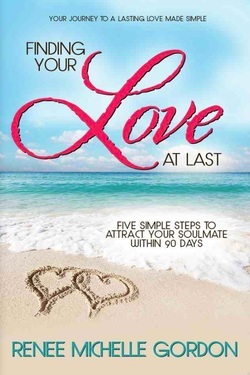 Wanting an easy to follow, step by step process that guarantees improved love results? If you said "yes" to one or more of these statements, you may qualify for my premium Platinum Coaching Package. In this coaching package, you'll be connecting with me, one-on-one to guide you toward your goal of finding your soulmate, your Mr. Right, your love at last. You will have actionable steps to produce between our sessions that direct you closer to your prize. Your coaching doesn't end once you've found your life partner. I will support you in your transition of single living to committed dating, to your wedding proposal, to your wedding day and through the beginnings of cohabitation together. This added support will help you avoid past conditioned responses and reactions and set you up for the most success that you could possibly have for your life. Includes 12 month one on one coaching with Dr. Renee, 1 day Kick-Off private session, single to married transition process and 5 - 10 minute love emergency "anytime*" calls! The best way to know if this program is right for my is to schedule a no hassle, no obligation FREE singles dating coaching session by calling 424-281-0170 or contacting us by email at Connect@Luvatlast.com . If you said yes to some or all of the above statements, the Platinum Coaching Package may be perfect for you. 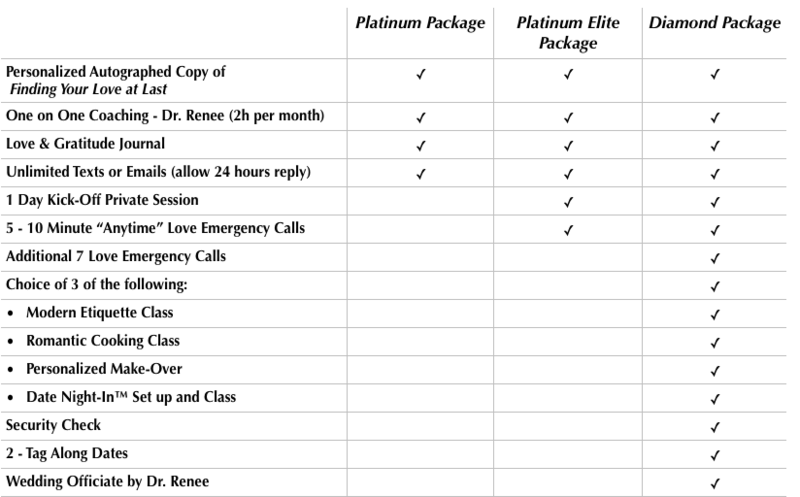 Your package includes everything that the Platinum Elite Coaching Package includes except the transition support which can be added later if you choose, 1 day Kick-Off private session and 5 - 10 minute love emergency calls. Gold Coaching Package is designed to get you started on the right path to finding your right soulmate, avoid the pit falls associated with modern day dating, create a new pattern that attracts what you desire while reflecting what you've attracted in the past. My Gold Coaching Package puts you in charge of designing, attracting and discerning who is right for you. It also includes valuable relationship skills to employ once you do begin your committed relationship to keep you happy and connected throughout the courting process well into marriage.